When I saw this recipe on Meg's blog, I knew I had to make it. We made it 2 days later :-). Jon and I love making soups but have never made a homemade chicken noodle. It was fun to make the noodles too! 1. Cut your chicken breasts into cubs and pan sear them until they are no longer pink. I drizzled mine with olive oil and sprinkled with Seasoned Salt. 3. Once the chicken is done cooking, place into a large bowl. Lightly saute the carrots, celery, and onion in the same pan using the juices from the chicken. This should take 3-5 minutes for the veggies to get soft. 4. The ratio for the noodles is 1 cup flour to 2 eggs. Mix together in a medium sized bowl...the dough will be very sticky so you may have to use your hands and add a little more flour. 5. Take the dough and roll out pretty thin (about 1/2 cm). 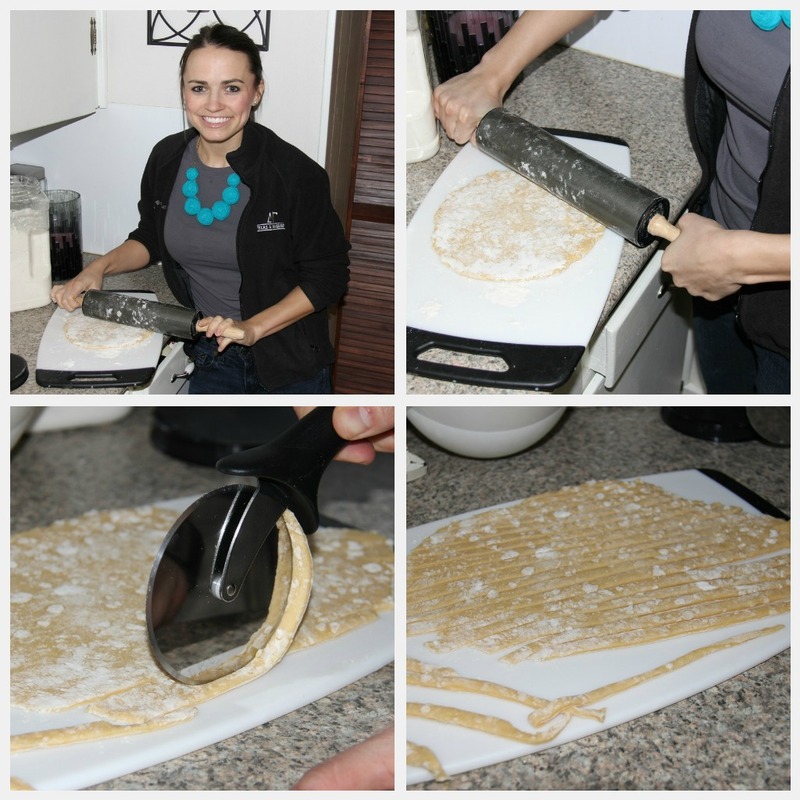 Cut your noodles with a pizza roller about 1 cm wide and a couple inches long. 6. Combine your chicken broth, cubed chicken and softened veggies and bring to a boil. 8. Add salt and pepper to taste. Enjoy! ooooh you made it!! how did it turn out for you two?? Oh man...I neeeeed to make this! Plus my husband is always saying he wants to make his own noodles but I am so intimidated. This actually looks do'able! That looks delicious... and not overly complicated! awesome!